Can I rent a portable toilet for 1 day or for a weekend? Absolutely. We have special event toilets that are exceptionally clean, attractive, and quickly delivered. We ensure that no special event toilets have ever been used on a construction site. Please call ahead to allow us to put the delivery in our schedule! During peak times of the year we often sell out. To ensure we can service you it is best to make your reservation as far in advance as possible. At a minimum it is best to place your order for portable toilet service at least 48 hours in advance. For large special events or job sites, a week or more lead time is advisable. For urgent needs we are often able to deliver toilets the same day for an extra delivery charge. 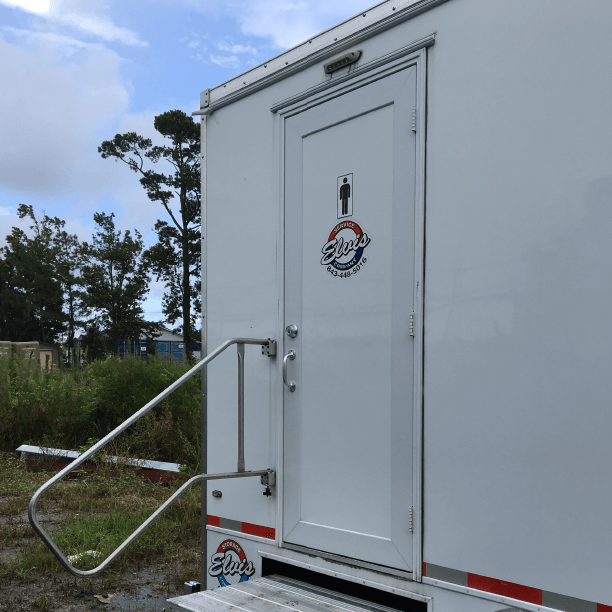 Most city ordinances specifically spell out the requirement of a portable toilet on a construction site and inspectors will require that a porta potty is ordered and either placed on site or on its way before approving the inspection. In addition, OSHA requires a portable toilet on a construction site under the Safety and Health Regulations for a Construction (1923.51 (c) (1), 1926.51 (c) (3), (I), (ii), (iii), (iv) ). For information regarding specific city or country ordinances contact the city where construction is occurring or your local United Site Services office. It is important for your workers to be able to use the restroom when working hard for you. An Elvis portapotty is the best way to keep your waste serviced and cleaned weekly. We service portable toilets once per week. This is done to keep the units fully stocked, clean and sanitized. The fee for the toilet includes the rental and once a week service. We can provide service more frequently if required. When a tip over of a portable toilet does occur we ask that our customers contact our office as soon as possible to report the incident. We will then dispatch a driver to come to the site and clean the unit or switch out the portable toilet with a replacement depending on the severity of the tip over. We will promptly respond to your porta potty and provde you with quick portable toilet service or porta-potty swap out. We greatly appreciate your portapotty rental business so we will keep your portable toilet (portajohn) clean and in great condition. 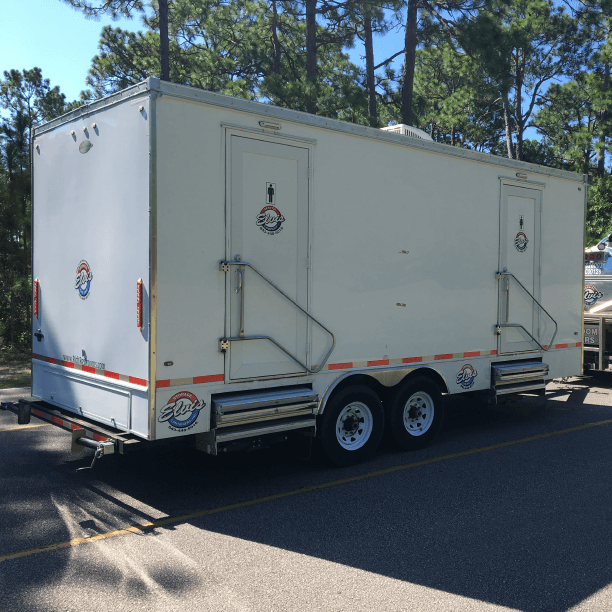 We are located in Myrtle Beach, SC so we can quickly respond to Conway, Pawleys Island, Georgetown, Wilmington, Sunset Beach, or Ocean Isle to clean your porta potty. 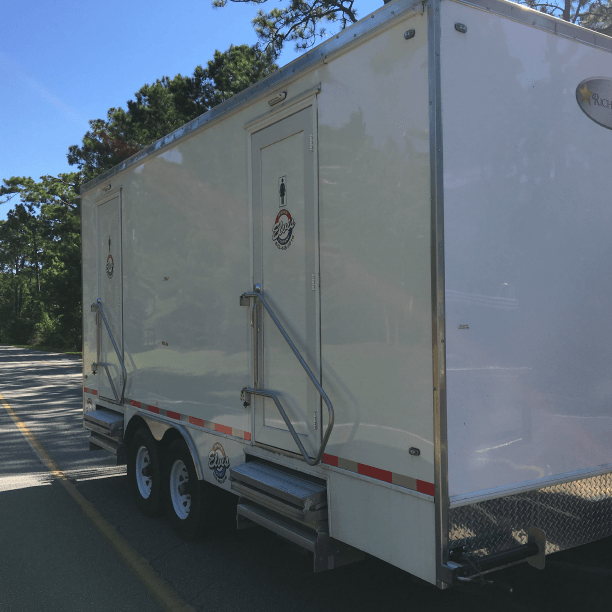 United Site Services offers portable wheelchair restrooms that are ADA compliant for use on a construction site, commercial area, or special event in some areas. Where available, our ADA units are large enough and obtain the proper elements to meet the standards that have been outlined by the Americans with Disabilities Act. Elvis Service Company not only pumps out the holding tank and cleans the inner bowl of the unit but also provides meticulous janitorial service both inside and out. Our employees clean and sanitize the portable restrooms at each service which includes washing with soap and water. We also provide a special detergent in the water, which acts not only as a sanitizer but deodorizer as well to keep the unit smelling great while reducing exposure to germs. You can count on Elvis to provide a timely pump out of the porta potty. We will service the portapotty weekly and you can count on the portable toilet to be very clean upon each portapotty service. What type of containers do you offer for my used cooking oil? Elvis Restaurant Services offers 3 different sized tanks depending on your needs. A smaller 50 gallon metal tank, a medium 125 Gallon polyethylene bin, and a larger 375 gallon polyethylene bin. Our poly grease tanks are the best suited for any restaurant as they are light weight waste oil receptacle that allow for easy clean up and swap out. When your waste oil tank becomes dirty we will be ready to give you a new grease bin to dump your fryer grease into. Will Elvis Restaurant Services keep my bin clean or be available in the case of spills or emergencies? Absolutely, we will regularly steam clean the bins and surrounding area, and we will always be locally operated in the heart of Myrtle Beach for any emergencies 24/7. You can count on clean grease recycling from Elvis. We pride ourselves in being the most thorough waste fryer oil company to pick up and recycle your old grease. If you call us and have a need for cleaning, we will be happy to assist. The grease bin is to be kept clean and the fryer oil is to be regularly pumped out. How much will a container cost me? The grease container can range from 55 gallon barrel, 125 gallon poly tank, 275 gallon poly tank, to 400 gallon steel tank. We also can install pumpout tanks to reduce your time in disposal of waste oil. We will install the containers for your use at no charge with the agreement of Elvis maintaining regular service of the Account. You can keep these containers for your fryer grease disposal as long we continue to buy the oil from the restaurant. The payment is sent monthly to each restaurant for the fryer oil recycled and we do not charge you for the tank. Start receiving money for your waste kitchen grease fryer oil today! Yes, we pick up waste fryer oil and we buy the fryer oil that you throw away. We will provide you with a waste grease tank, and we will pump the grease on a schedule determined by your restaurant. We will send you a check every month for the waste grease. We buy all waste fryer oil that you put in the tank! The oil is recycled through cleaning and refining processes at Elvis Services and then distributed to BioDiesel plants for use in green energy. It is a great way to go green by letting Elvis recycle your grease and provide it to Biodiesel plants. If you have old grease waste and you are throwing away your oil, please call Elvis to make sure you are receiving the best service and prompt payment for your oil. Kitchen grease, waste fryer oil, veggie grease, used cooking oil, and fryer grease is all worth money. Make sure you are being paid! We provide you with a clean waste oil bin, and ensure your tank is kept clean. If you need a waste oil receptacle, call Elvis today. We have many different kinds of grease tanks, and they do not cost your restaurant anything! How frequently should my in ground sewer grease trap be serviced? All grease traps are unique due to the various sizes and volume of FOG (Fats Oil and Grease) that are generated by the restaurant. Depending on your need we can schedule bi-monthly to bi-annually services. Some grease traps fill up in a few weeks, and need to be pumped out monthly. Some restaurants do not fry as much food or do not generate as much kitchen waste. These grease traps may be able to be serviced every few months. It is important to check with your local regulator to understand the regulation as to grease trap pumping frequency. Some towns or counties may mandate you to pump out your grease trap on a frequent schedule. Regardless of how frequently you need to pump your grease trap, we would appreciate a chance to provide you with the cleanest and most depenable grease trap service locally in Myrtle Beach, SC. Remember you also may need your septic tank cleaned and pumped out. We can do that too! A storage container is a intermodal shipping box or shipping pod that we have available for you to rent as a monthly rental. We buy the conex box and clean and paint them so that the storage container box is in great shape for you to rent. We will deliver the shipping box to your location and pick up the box when you request. We rent these storage containers in conjuction with our mobile office boxes. These mobile office boxes are storage containers that we have redesigned into office units. Please see the pictures of the office box at our storage web page. We rent storage containers, conex boxes, and storage trailers all across South Carolina and North Carolina. We will strive to deiver your POD as quickly as possible. These mobile containers are staged in different locations including Charleston, Georgetown, Florence, Myrtle Beach, and Wilmington to provide you with the quickest reponse time for your construction storage pod. We will bring the conex box directly to your job site and will place in the area you desire. For best service, please allow 2-3 days for delivery of you office container, mobile storage box, or storage trailer. Our 48 foot storage trailers can be delivered directly to your warehouse for merchandise storage. We also have 53 foot trailers for storage and rental. You can rent mobile storage trailer, mobile office boxes, and mobile storage pods all with Elvis Service Company.